A life-changing rehabilitation aid to provide assisted walking to those who need it most. 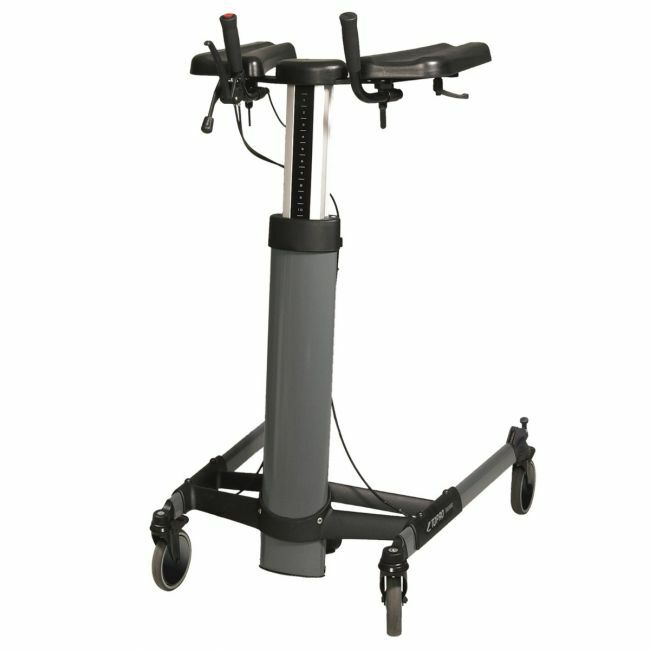 The Taurus E is a rehabilitation aid suitable for care home or hospital environments. Providing excellent upper body support, this product doubles as a walking aid with many premium features that encourage moving with confidence. The variable height adjustments of the Topro Taurus electric walker is controlled via a flip switch on the handles. Press it and the Taurus moves up and down to the required height. The Taurus can lift the user effortlessly from bed and chair into a standing position. Some users will find it is possible to use safely without the aid of a care worker. The adjustable height and width allow perfect fitting to the individual. All adjustments are easily made without requiring any tools. Premium model benefits from adjustable handles, driving and parking brake, lock for swing on wheels, and is delivered fully assembled.